When I was 18 I was diagnosed with severe PCOS. Over the course of the previous year I had gained close to 100 pounds from the hormone problems associated with the syndrome and I was miserable. I was so embarrassed of my weight that I really stopped being who I really was, a happy and outgoing girl who lover to laugh and be with friends. I shut off so that I didn’t bring attention to my weight. When I was 22, I had my first child. By the time she was 6 months old I was the biggest I’d ever been. My body hurt, I could barely carry her car seat without passing out from being out of breath….and I was so uncomfortable in my own skin. One day I was watching her and it hit me that I had to change my life or I’d leave her motherless. My mom died at 49, and the thought terrified me that I’d do the same to my own daughter. 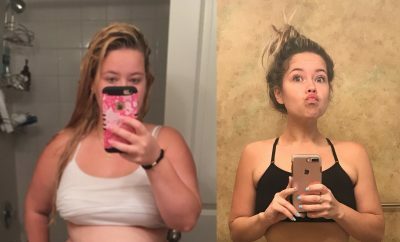 I had tried a million “fad” diets and nothing ever stuck, so I was determined to do it the right way this time, through change in my eating habits and exercise! I walked. And walked and walked and walked, because really it’s all I could do in that body. I walked an hour every night, 5 nights a week. Then, overtime, I started to bike, lift weights and swim. It was a slow process, but it worked! It was a struggle to see the results in myself during the long road of weight loss. I lost 40 pounds over the course of a few months and then things slowed down. My body was changing all the time. I noticed my arms and thighs first. It was an incredible feeling! 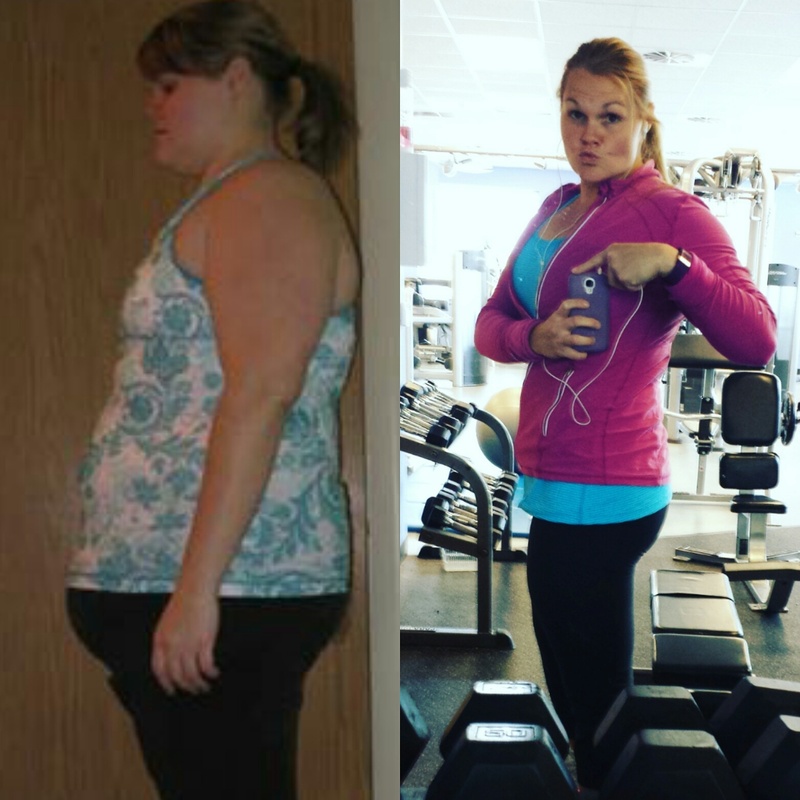 I feel like the biggest obstacle was my PCOS. 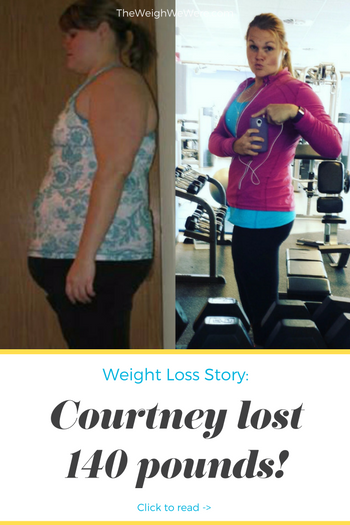 It made losing weight feel impossible at times. One step forward, three steps back. My doctor changed medications to try to help, but it was definitely a learning process on finding the balance of it all, diet, exercise and medicine for my disease. 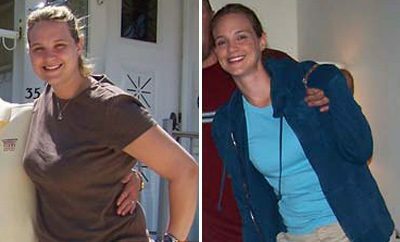 My husband, who somehow fell in love with me despite my obesity at the time, was my greatest supporter. He never complain about our changes in meals (even though he weighed only 150 lbs himself and was far from needing a diet) and exercised with me too. He’d never let me give up, but he’d sit and let me cry to him when I felt discouraged. He honestly was the reason that I succeeded. He is amazing. I hit many plateaus along the way and generally they had to do with my diet. I would up my caloric intake (while still staying with healthy foods) for a few days and then drop back down and it generally got things moving again. It took 18 months for me to hit my goal weight. I then gained back 60 pounds after having 2 more babies and have since lost all of that but my last 15, which I am working on now. Being able to run and play with my kids at the park without being out of breath was a huge NSV for me! I eat lean meats and lots of veggies! I avoid processed foods when possible and try to avoid “fast food”. I find that cooking at home allows me to meet my goals while having delicious and healthy meals. Sadly, when I was heavier fast food and processed foods were in my daily diet. When I was obese I avoided activities as much as possible. I hated sports and even walking to my car broke a sweat. It was embarrassing. I now exercise daily and live it! I’ve been able to run half marathons, race triathlons, and play on a softball team with my husband! Love yourself. Your body can do AMAZING things…. and it will! See the power and beauty you have inside yourself and you’ll see that you can do anything! Drink LOTS of water. Water, water, water. Give up soda and sugary drinks. Your body will thank you! Focus on a healthy balanced diet. Lean meats, veggies, whole grains, etc. Avoid foods that are labeled “low fat,” “diet,” “low calorie” – if it needs to tell you these things then it’s probably not good for your body. Exercise can be hard, but it’s worth every drop of sweat. Your body will get stronger. Your stress levels will drop. Your body will hurt less. You will feel like your can take on the entire world! When you feel like you can’t go on anymore with your life change…. give yourself a day. Eat what you want (don’t go too crazy). Take a day off from exercise. One day will not kill all your hard work, but it can give you the reset you need to start strong again the next day! Thank you so much for sharing your story. It reminds me so much of my own story from a few years back. I started making the same changes and was able to lose 80lbs (from 297 down to 217). I felt amazing! But, sadly, after some major life changes, I allowed myself to get out of my routine and old habits creeped back in. Now two and a half years later I find myself right back where I started. But reading your story is an encouragement to me because it reminds me of how bad I felt when I started and how amazing I felt when I was able to do things I hadn’t done in years. I want to feel that way again…happy, healthy, confident, and adventerous. It’s going to take alot of time and effort, but I am reminded by reading your story that it is absolutely worth the struggle.